Home » Siberian_Tiger » Pictures » !For Snake_Eyes :3! Don't cry! I love you Kimahri and all your Ronso glory. I play as you in FFX whenever possible and I use you in every battle so as to train you into a hulking powerhouse of hurt. I made you go round the ENTIRE sphere grid. Not a single stat unlocked. It...was...beautiful... To see you kill Braska's final aeon in only three mighty swings. (That's counting one for his first form and two for the second, folks.) Kimahri is greatness, and whoever disagrees gets stuck in a room full of insane rabid Kimahri fans. (who also haven't been fed in a while, it's too scary to go near the cage). 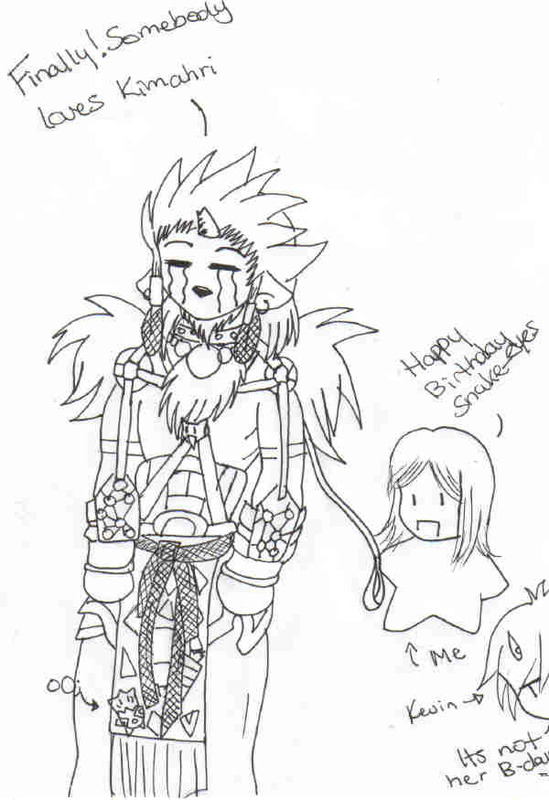 So Kimahri don't fret, I love you enough for hundred people! Heck, a thousand! Power to the Ronso!! Oh and Siberian Tiger? (teary eyed) You have blessed the greatness of Kimahri with more fanwork in a world that seems to neglect him. I thank you. Plus, the drawing was cute. Two, apposable Ronso thumbs way, way up. me loves the togepi..it's so cute!